Get along, little dogies. It's been a hard day, and I've got the boots to prove it. Wes is out of town for the night. But Finn is keeping me distracted, and definitely not lonely! 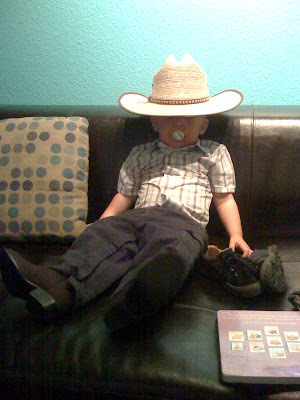 He brought me the boots as he was fixing the hat on his head. I had a good 5 minutes of giggles as he climbed up onto the couch to watch The Wonder Pets from under the rim of his hat. How can you not love motherhood? I must have been so BORED before he came along. That picture is awesome. Don't you wonder what the heck you did before kids? I'm sure I didn't take advantage of all that free time, but I had no idea what I was missing. He is ALWAYS so darling. so cute, he looks like his grampa. congrats on the new girl!